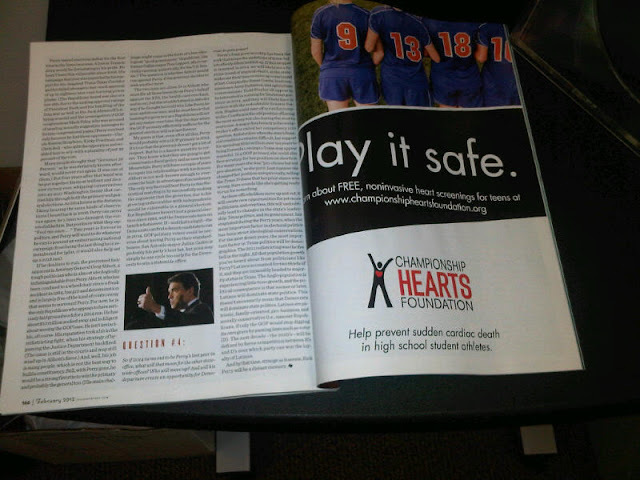 Championship Hearts Foundation is a nonprofit offering free heart screenings to high school athletes in Texas. Did you know that Hypertrophic Cardiomyopathy is a serious heart condition that affects 1 in 500 people? I've worked with Championship Hearts Foundation for the last five years, designing their business cards, brochures, website homepage, posters and invitations. Recently, I was hired to help them create a campaign to raise awareness of their cause. Each advertisement I designed has the tagline "Play it safe" with a photo displaying a photo of a high school sport such as soccer, football, track, band and cheerleading. We kept it simple and to the point with the wording, colors and image. This month, the soccer ad I designed is displayed in Texas Monthly magazine and the back of the HEB magazine. Last year, it was on the jumbotron at the University of Texas-Austin football game. This is such a worthy cause and I'm thrilled to be a part of it. 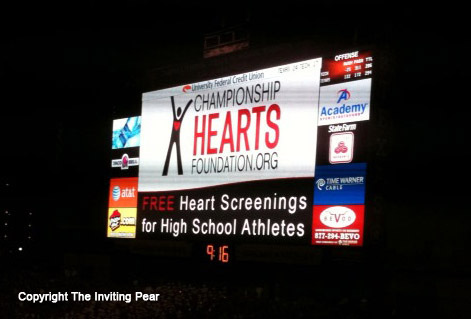 If you have or know a high school athlete, be sure to get a free screening through Championship Hearts Foundation. It may save a life.